My phone is samsung wave y young GT S5380D , always continiously restarting to program not running why ? Also can i upgrade os bada to tranfer program android os ...? assu, 23 Sep 2012hey dear, thanx a lot i'm using the same phone bt your reply l.....it just shows that there ... moreplz use 3G sim for use vedio calling..
dalu, 09 Apr 2012it is good phone iam useing this phone for last 1 month but the a-GPS is not goodhw to use A-gps dear? 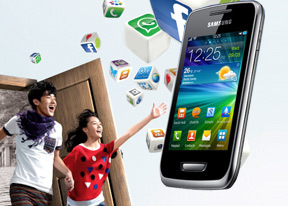 Iam using samsung wave y.It not saporting to NIMBUZZ application.